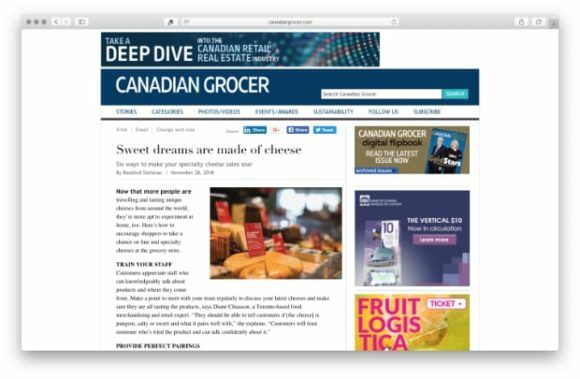 From product sampling to providing perfect pairings, Canadian Grocer is helping stores to sell more cheese to more customers with this article. For busy customers, convenience is king. Have a variety of pre-made cheese trays on hand, especially during the start of weekends and holidays when shoppers are more apt to entertain. Make sure you have smaller cuts of cheese handy for the budget-conscious or impulse shopper. And consider providing a checklist of cheese options for customers to fill in that will be assembled and ready for pick up by the time they’re finished shopping. Or provide a DIY card if they want to assemble it themselves. Cheese, like wine, can be intimidating, so the more you can guide them the better.